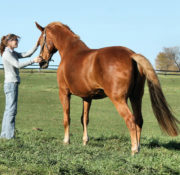 Windsong is from valuable old Hanoverian lines. Her mother SPS Ricarda produced 3 daughters – all SPS or Elite Candidates, and many sporthorse geldings who have remained in Germany. Windsong’s sire is Weltregent, a Weltmeyer / SPS Donnerhall / SPS Pik Bube stallion who was successful up to Grand Prix under Hannes Baumgart. In spite of being available only “live cover”, Weltregent was in the “Top 5%” of German Dressage Sires throughout his breeding career. 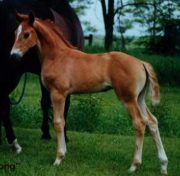 Windsong made her mark early on as “Champion Foal 2001” at her Belleville Foal Inspection. 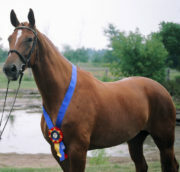 She was entered in Mare Shows as a 2 year old and a 4 year old – earning “1A” prizes on each occasion. She also completed a successful MPT at 4 years of age. Windsong is pictured here at 6 weeks; be-ribonned after her successful MPT, and again as a mature mare in 2016. Also shown is her “Royal Rhapsody” by Royal Prince. Breeding History: Winnie produced a beautiful Royal Prince colt in 2008 and a Donnerwiess colt a year or two later. 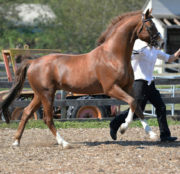 Royal Rhapsody was Reserve Champion of his Foal Inspection; both boys have gone on to successful dressage careers. 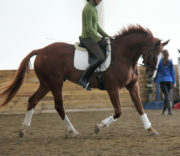 Windsong competed in dressage for several years under Siri Ingebrigsten and under her adoring AA owner Genevieve Lavigne. Windsong is in foal to the beautiful, talented Sir Gregory (Sir Donnerhall / Don Gregory) for a June 1st, 2017 foaling. Sir Gregory is also pictured here, with video below. Currently, the in-utero Sir Gregory foal is priced at $10,000 US, LFG, full board and care till weaning.